How to Easily Master Format HUAWEI ASCEND P6 / P6 DUAL with Safety Hard Reset? Tips and Tricks for solving problem at HUAWEI ASCEND P6 / P6 DUAL. The HUAWEI ASCEND P6 / P6 DUAL is one of the word thinnest smartphone which have 6.2mm thin. HUAWEI ASCEND P6 have kind of product, one is HUAWEI ASCEND P6 / P6 DUAL who have single simcard slot but already have external micro SD simcard, the other one is HUAWEI ASCEND P6 DUAL which have double simcard slot but the place for external micro SD simcard is replace by second simcard slot. How to Fix and Problem Solving for Recovery HUAWEI ASCEND P6 / P6 DUAL hang or not responding or malfunctions or stuck or freezing or bricked ? With quad core processor together with 2GB RAM will run faster run almost every Android applications from which can be download from Google Play Store. But as we know that is easy to share anything at Google Play Store, so the unresponsive application also can be find and download from that place. Some kind applications could make the HUAWEI ASCEND P6 / P6 DUAL become problem like hang or stuck or bricks or frozen or LCD touch screen not responding. In this case you need to do soft reset or reboot or restart HUAWEI ASCEND P6 / P6 DUAL to delete some temporary files and cache. If the problem still happen, then you have to do hard reset or master format HUAWEI ASCEND P6 / P6 DUAL. How to Soft Reset or Reboot or Restart HUAWEI ASCEND P6 / P6 DUAL ? The battery of HUAWEI ASCEND P6 / P6 DUAL is non removable, so we can not remove the battery when the HUAWEI ASCEND P6 / P6 DUAL stuck or frozen. If you can not access the menu or LCD touch screen is non responsive, you can force reset HUAWEI ASCEND P6 / P6 DUAL by pressing POWER BUTTON for about 10 seconds until the phone restart by itself. If the LCD touch screen still respond with our touch, then other way to restart, try to press power button several seconds, until menu appear. Choose restart/reboot than the HUAWEI ASCEND P6 / P6 DUAL will do the soft reset or restart. This is safe to do because all data or installed applications will not removed. The HUAWEI ASCEND P6 / P6 DUAL will continue the step until ready to use in clean factory default. How to Restore and Reinstall Clean Android Operating system / firmware at HUAWEI ASCEND P6 / P6 DUAL ? Maybe because of applications problem or invalid setting, the HUAWEI ASCEND P6 / P6 DUAL become problem and for some reason, we need to reinstall or restore the clean and factory default Android operating system or firmware at HUAWEI ASCEND P6 / P6 DUAL. This situation is common for Android user. Almost every user can do reinstall or restore the clean and running well operating system from this smartphone, because the source file of Android operating system or firmware already saved inside HUAWEI ASCEND P6 / P6 DUAL rom, so we do not need to connect other gadget to reinstall it. Just do the step for hard reset or master format above, then the HUAWEI ASCEND P6 / P6 DUAL clean and default operating system will be reinstall by itself. How to Unlock or Fix or Bypass or Solutions for HUAWEI ASCEND P6 / P6 DUAL forgot password code or security lock screen pattern or pin? For security reason, we can give screen lock pattern or password pin or other alternative protection at HUAWEI ASCEND P6 / P6 DUAL, so the data will be save when the smartphone away from us. The problem happen when we forget about the answer of security protection password or screen lock pattern. The solutions already prepare by Google to bypass forget password or screen lock pattern security protection, try to find Forget Password / Pattern button, press that button then it will bring us to answer the Google account which have already installed before. If we can not access the Google account, then the only solutions is doing hard reset or master format. How to Improve Performance HUAWEI ASCEND P6 / P6 DUAL to make run more faster? The HUAWEI ASCEND P6 / P6 DUAL specifications is fast, and we do not need to worry because the RAM is big as 2GB RAM. But as we know some applications maybe not coding well, so it can be run with hungry resources, so it will bother other applications to run. Some applications also run in the background and need to do update or do something as background process. If we install a lot of background process applications, it may make the HUAWEI ASCEND P6 / P6 DUAL become slowly. To make it faster, try to reduce the background process applications by uninstall not use applications. But if we want to make it faster like new again, we may consider doing hard reset or master format HUAWEI ASCEND P6 / P6 DUAL. Is That Any Secret Code for Doing Format HUAWEI ASCEND P6 / P6 DUAL ? There is no secret hidden code for HUAWEI ASCEND P6 / P6 DUAL to make it back to factory default. Do the options above to hard reset it. How Can I Replace Battery of HUAWEI ASCEND P6 / P6 DUAL (Battery Replacement) ? HUAWEI ASCEND P6 / P6 DUAL has non removable battery, so we do not recommended any user open the HUAWEI ASCEND P6 / P6 DUAL case to change the battery by our self without have experience. If we find the battery of HUAWEI ASCEND P6 / P6 DUAL has problem or already expired and need to replace, then we can bring this smartphone to nearest Huawei official service center, because the professional team will do it easily for us. Please only replace the HUAWEI ASCEND P6 / P6 DUAL with original Huawei Battery to keep our smartphone working without problem. How to Upgrade or Update HUAWEI ASCEND P6 / P6 DUAL to Android Lollipop ? This first time release using Android Kitkat firmware as factory default operating system. Until today we still not get any information about how to update HUAWEI ASCEND P6 / P6 DUAL with official Android Lollipop from Huawei factory. If we browse to some other community, maybe we can find 3th party custom rom or operating system for HUAWEI ASCEND P6 / P6 DUAL using Android Lollipop, but be careful to flashing non official rom, because usually some features can not work properly and if we do some wrong steps while flashing, then our HUAWEI ASCEND P6 / P6 DUAL will be corrupt and can not use anymore. [Q] What happen to my huawei p6 if it display the message. That ask me to bring the microphone closer and say the name slowly when screen is off? [A] Hi, it seem that you have installed some applications that need to activate using your voice or voice lock. Please make sure you know the answer for that lock screen features. If you still can not unlock, then you have to do hard reset using hardware button combination key or using microSD dload files like steps at #option 3 above. [A] Hi, if your Huawei Ascend P6 still get the same problems, then please do hard reset or reflash the firmware using microSD simcard like steps at #Option 3 above. You need to download correct firmware files from Huawei mobile official website. You also can bring your Huawei Ascend P6 to Huawei authorize service center to get help reformat and reinstall with fresh updated firmware. The information from this page describe about Huawei p6 hard reset,huawei ascend p6 secret codes,huawei ascend p6 stock on logo,huawei P6-U06 not touching reasons. If you need another resource for hard reset, use search function at this homepage or find from our related posts. How to Easily Master Format SAMSUNG GALAXY LIGHT SGH-T399 / GARDA with Safety Hard Reset? only appear anroid..cannot format…file fail mount/cache(invalid arguement.what should i do. 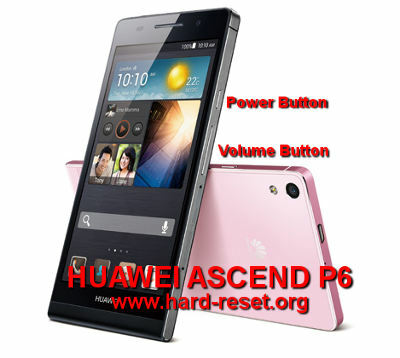 Hi, you can try hard reset using hardware button combination key, or we also suggest you to find Huawe Ascend P6 ROM from http://consumer.huawei.com/en/support/index.htm and find firmware for Huawei Ascend P6. Download that rom using your computer and extract all ZIP files include folder to MicroSD using card reader. Please follow steps at #Option 3 above to finish flashing or reinstall new update firmware using external card. Hi, it seems that your Huawei P6 get hardware troubles. Maybe you should try to use different Android charger which have minimum 1 A current output and charger minimum 2 hours, just to make sure your charger is fine. If still can not work, then please try to discuss with Huawei authorized service center for further hardware check. Thank you!!! The hard ware key reset button worked!!!! You guys are awesome..
Hi, if your Huawei Ascend P6 still get the same problems, then please do hard reset or reflash the firmware using microSD simcard like steps at #Option 3 above. You need to download correct firmware files from Huawei mobile official website. You also can bring your Huawei Ascend P6 to Huawei authorize service center to get help reformat and reinstall with fresh updated firmware. What happen to my huawei p6 if it display the message. That ask me to bring the microphone closer and say the name slowly when screen is off? Hi, it seem that you have installed some applications that need to activate using your voice or voice lock. Please make sure you know the answer for that lock screen features. If you still can not unlock, then you have to do hard reset using hardware button combination key or using microSD dload files like steps at #option 3 above.